Have you tried Delicata squash before? It’s one of my favorite winter squash varieties for a couple of reasons. First of all, it’s easy to work with the Delicata. Unlike other winter squash varieties with extremely thick skins that are difficult to cut (hello..Butternut squash I’m talking to you) the skin of a Delicata is tender and edible. It’s very easy to cut and clean. A sharp chef’s knife will easily cut through the skin of the Delicata and the seeds can easily be scoped out with a spoon. Even more important, the Delicata has an incredibly rich and creamy taste when cooked. Sometimes referred to as the “sweet potato squash” Delicata is especially delicious when roasted, which allows the edges of the squash to slightly brown, imparting a caramelized flavor with hints of brown sugar. Perfect for stuffing with savory sausage and apple etc. How to pick out a Delicata squash- Look for a squash with even, light-colored skin that is relatively heavy for its size. A ripe Delicata will be light yellow in color with green striations on its rind and have some orange flecks on the skin. As the Delicata squash ages its skin turns a deeper orange, so make sure to look for a squash with lighter skin. 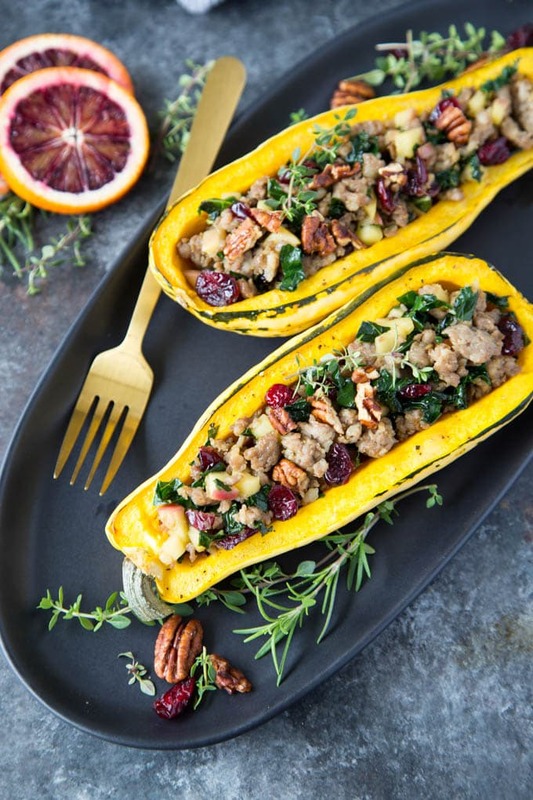 Sausage-Stuffed Delicata Squash is a great alternative to traditional bread based stuffing for those following a gluten-free, paleo, low-carb, or grain-free way of eating. Or, if you are looking for a healthy side dish to make or take to a Thanksgiving or Holiday celebration. You can roast the squash and prepare the “stuffing” ahead of time. 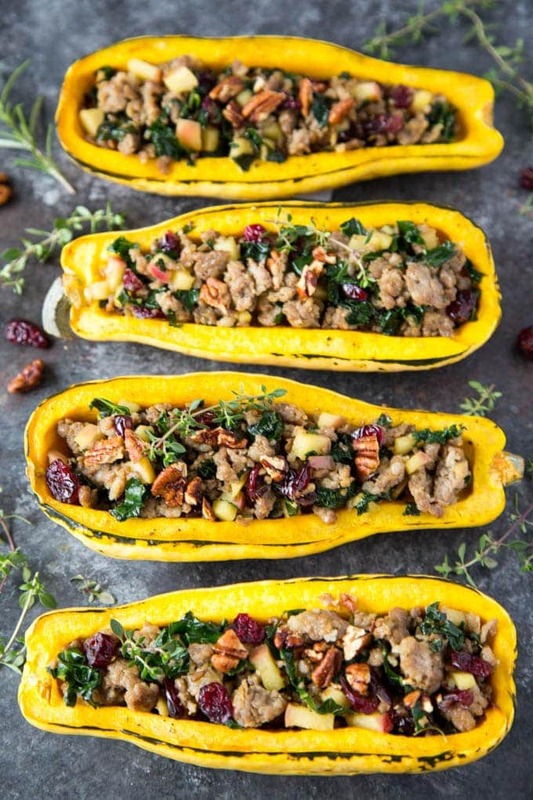 Just store the squash and stuffing separately and heat and assemble just before eating. For an added “WOW’ add a drizzle of maple syrup and put the stuffed squash under the broiler for few minutes ( approx. 5 – 7 min) for some extra caramelization. 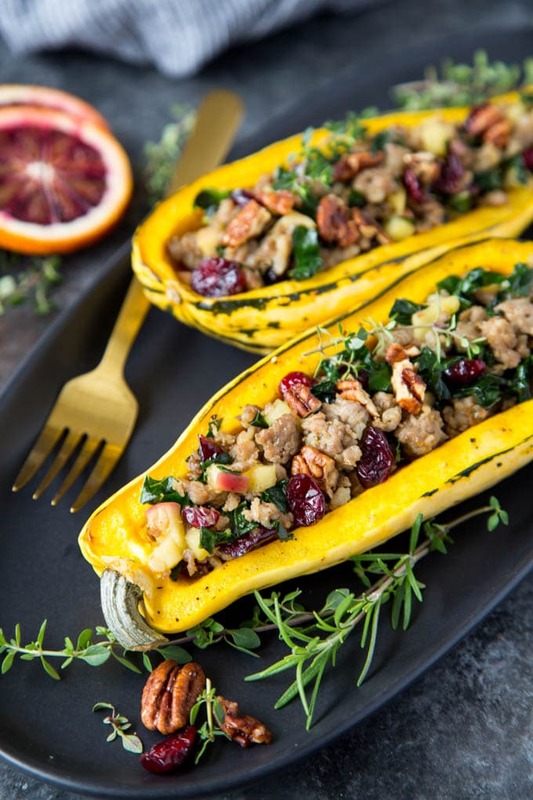 You don’t have to save this Sausage-stuffed Delicata squash just for the Holidays, it makes a great “all in one” Fall/Winter meal as well. Looking for more healthy holiday side dishes? While squash is roasting, heat remaining 2 tsp olive oil in a large non-stick skillet over medium heat. Add sausage, onion, and garlic. Cook until sausage is browned and onion is translucent, stirring to break sausage apart (approx.10 mins.) Add kale, apples, rosemary, thyme, sage and additional salt and pepper if needed. Continue to cook until the kale turns bright green and becomes tender (approx. 5-8 minutes). Stir in cranberries and cook for an additional 1 minute. Spoon sausage mixture evenly into squash halves. And sprinkle with toasted pecans. Optional step- preheat broiler and arrange stuffed squash halves on foil lined baking sheet . Drizzle with maple syrup. Broil until the tops of stuffing and squash are golden brown (approx. 5 mins). Squash and Sausage filling can be prepared a day ahead of time. Store squash and sausage mixture separately. Heat the squash ( cover squash in foil and heat in oven at 350F for about 10 minutes) and sausage mixture ( in pan on stove) and assemble, garnishing with pecans just before serving. Or , line a baking sheet with foil and assemble squash and sausage mixture. Add a light drizzle of maple syrup and broil in oven for approx. 5-7 minutes. What other squash can I use if I cant find this one? 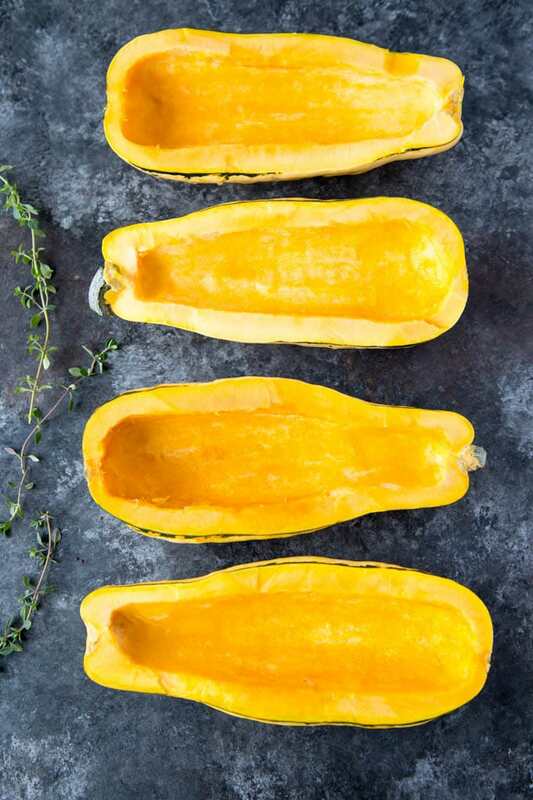 Jackie- I haven’t personally tried this recipe with other varieties of squash but I think there are many that would work, like butternut, acorn, or zucchini. You’ll just need to adjust the cooking time for the squash based on the variety and size of the squash.